Bunny battle is a 2 player bunny race that makes use of the Kinect as the only input device, and trampolines for added fun. The main mechanic of the game is physically jumping up and down (because you're a bunny!). This made using trampolines a logical peripheral, as it makes jumping easier and less tiring. For this project I was the lead artist, as the other artist on the team took on the role of producer and as such had less time devoted toward the art assets needed for the project. Being the lead artist on the team, I modeled and textured the majority of the assets for the game, including the rabbit model which was rigged and modified by Prasanth. While I may not have modeled every single object in the game, all the texturing was done by me. The hoses were modeled by Pradnesh Patil. This image is to show the snow modifications I made, as well as the texturing of the buildings. The non solid color textures were all made in Photoshop, and were simplified to match the rest of the environment's flat color aesthetic. As development drew to a close, my team and I decided that the winner should have some win scene where an award is presented. 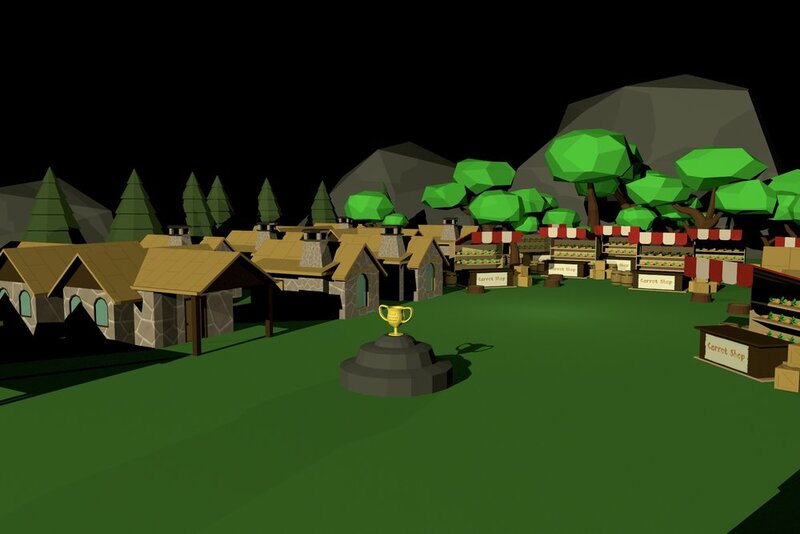 I made a quick model of a trophy and a makeshift pedestal, and put them a small village scene that was would be seen at the end of the race track. The race was to take place on a path through the woods. Since this required a lot of environment assets and I only had two weeks to make them, and still make the character, I decided to use low poly models that could easily be moved around and resized to have some semblance of diversity. Late into production, it was decided that there was a need for a snowy part of the forest that lead to a snow terrain. My nature assets were then modified by another member of the team to include snow, while I modified my buildings as well as another building model that was provided to me.